Oklahoma Connection | Atkins came to Oklahoma City, Oklahoma, with her husband, Charles and son, Edmund in 1951. 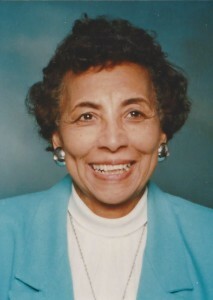 Hannah Atkins was the first African-American woman to be elected to the Oklahoma House of Representatives (1968-1980). A North Carolina native, Hannah Atkins received her degrees from St. Augustine College and the Graduate Library School of the University of Chicago and worked in the university’s library until moving to Oklahoma. She attained her Masters Degree in Public Administration from the University of Oklahoma and was elected to the House of Representatives in 1968, where she chaired the Public and Mental Health Committee. She authored landmark legislation in the fields of mental health, education, and legislative reform. U.S. President Jimmy Carter selected Atkins for duties at the United Nations and Governor Henry Bellmon appointed her Secretary for Social Services (1983-1987) before she was appointed to serve as Secretary of State in 1988. She was inducted into the Oklahoma Women’s Hall of Fame in 1983.